Last night it was claimed that Valve had sent a second round of Cease & Desist notifications to 20 websites including CSGOBetting.com. 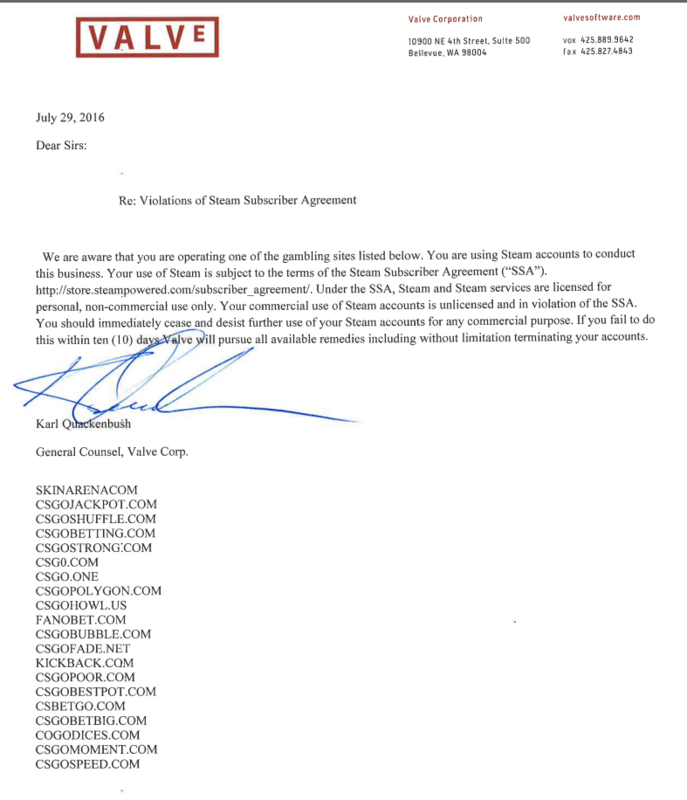 As of Saturday, July 30th, neither CSGOBetting.com nor any of our directors have received any electronic notification of such a Cease & Desist letter. We have not received any physical letter either. CSGOBetting.com has never operated any gambling service and has never utilised Valve’s API in any way. We solely advertise regulated and licensed bookmakers and other gambling sites, such as casinos, who comply with the laws of the United Kingdom, United States of America and Australia. We have never advertised any skin betting site, skin casino or jackpot style site, or site where users can sell “skins” or any other virtual items for money. Thus, we doubt the legitimacy of this letter. While we completely welcome any action by Valve or other authorities to shut down unregulated and unlicensed skin betting websites, in this case we believe the letter to be fake. Not only have we not received the letter, it would be nonsensical for it to be sent to CSGOBetting.com in the first place.